In 1937, Irene Dunne was at the height of her career. The year before, Dunne received a Best Actress Academy Award nomination for Theodora Goes Wild, a comedy role she was reluctant to take. Not only was that picture a critical success for Dunne, but a huge box office hit for Columbia Pictures. So it wasn’t a surprise that the next picture she would make for the studio would be another comedy. What Is The Awful Truth? The plot revolves around the marital woes of Lucy (Dunne) and Jerry (Grant) Warriner. Each becomes suspicious of the others’ marital fidelity, which eventually leads them to divorce court. After the divorce, Lucy and Jerry are consumed with foiling each others’ new romantic interests. Is the awful truth the fact that Lucy and Jerry are still in love? Like Dunne in the previous year’s Theodora Goes Wild, Grant wasn’t too happy working on this film. Director Leo McCarey’s working style didn’t sit well with Grant and he tried to get out of the movie, even going so far as requesting he swap roles with supporting player Ralph Bellamy! McCarey liked to get spontaneous performances out of his cast, which meant a lot of on-set improvising, which Grant found unsettling. Eventually things worked out for all concerned. Ironically, this is the movie that catapulted Grant to superstar status and is responsible for the Grant movie persona beloved by generations of moviegoers. For Dunne, The Awful Truth was a delightful experience. She loved working with both McCarey (who became a personal friend) and Grant. Professionally, it was another triumph. Once again, the critics raved about her and the film. And once again she was nominated for Best Actress by the Motion Picture Academy. If there was any doubt about Dunne’s comedy chops, they were all dispelled when the film was first released on October 21, 1937. Dunne and Grant would go on to star in two other popular films: the comedy My Favorite Wife (1940) and the melodrama Penny Serenade (1941). 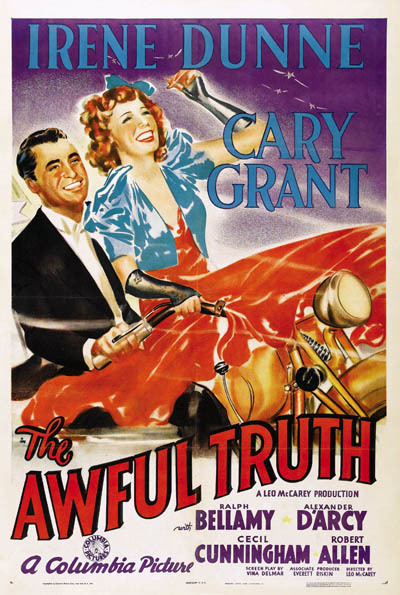 The Awful Truth was nominated for six Academy Awards, including Best Picture, Best Director, Best Screenplay, and Best Supporting Actor. 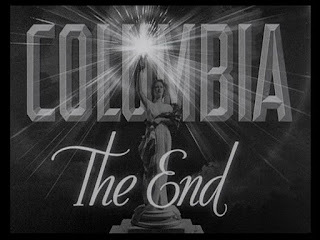 McCarey won the only Oscar for his direction and insured his place in motion picture history. 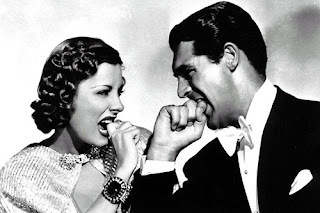 In 2000, the American Film Institute listed The Awful Truth at #68 on its list of 100 Years…100 Laughs. In 2002, the AFI listed it at #77 on the 100 Years…100 Passions list. This post corresponds with the class Elegant and Madcap: The Incredible Versatility of Irene Dunne—Class starts November 16, 2011. Meets on Wednesdays from 7p.m. - 10 p.m. for six weeks. Classes are held at Facets Film School on Fullerton Ave. in Chicago, IL.